I am looking for 7 inch wide top seats, 44 3/8-44 5/8 long for an Asahi pool. Part # 1171. Can you help? 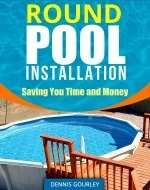 I'm looking for vertical end caps for a 24" round doughboy pool. The paper says it needs 36 of them and the pool store in town says they are obsolete. I purchased my home with an existing in-ground/above ground swimming pool steel walled. 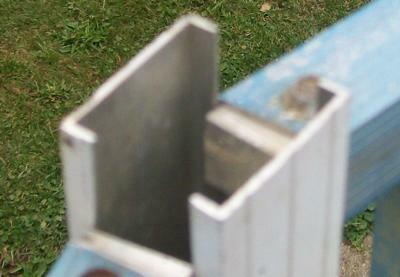 The previous owner scrapped the edging/coping assumed to have been aluminum. I have no idea what I should be looking for in search engines!! I have attached photos. 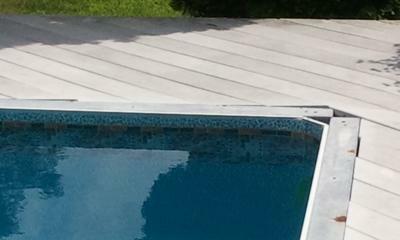 The Trex decking is abutting the edge of the steel and is level for the most part. There are holes in the steel where I'm assuming it was once attached. Any help would be appreciated. We were given this 15'x30'x48" AGP, but I have no idea what brand it is. The people that gave it to us said it was a Doughboy (they bought it used). I don't think it is and was curious as to what brand it truly is. I'm actually looking for replacement caps for the aluminum posts. 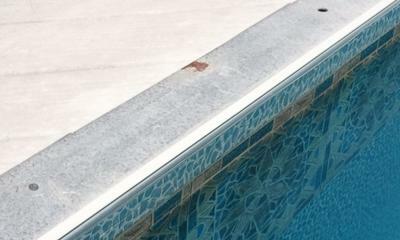 It takes a beaded liner that fits into the aluminum walkway around the pool. Any help identifying this pool or caps would be appreciated. Hi Dawn. One thing for sure, it is not a Doughboy. Hi Dawn, I'm checking to see if you ever found these caps you are looking for. I need them for my pool also. Also wondering if you found out what brand of pool it was. I've found different names during my search that might be what your pool is. Royal by USA or it could be called Ambassodor? Our pool was sold by a co named Penguin Pools in Tulsa, OK back in 1995-1996. Anyone ever find out a brand or model name for this pool? I have been searching for days trying to find information about a pool just like this that I'm thinking about buying but even when I do manag to find others like it there's never anything listed to identify it's origin. 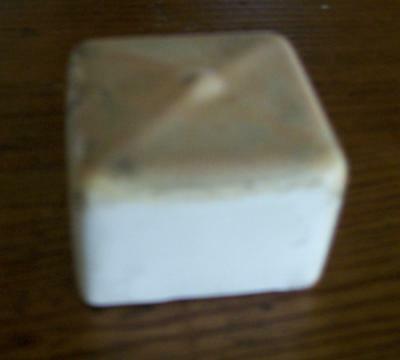 I bought mine through sapphire pool in new Jersey with a manufacturer in Harrisburg (looking for name) sapphire has since closed aka advertising copy. Door to door salesman. This is a Sea Isle and can get parts from midwest pools and USA industries out of new jersey. Its also called a Bermuda King. I have the round version. I have this pool, bought it from a company called Diamond Pool. It's a Brumuda or Sea Isle which ever, it's an oval. Guy came door to door. Not sure what they are called now. I have had it 10 yrs. No problems but I need a new liner. Anyone know if this is a j hook liner? Where can I get a replacement liner cheap? I have a used Pacifica above ground that I am setting up, but 4 of the bottom rails are rusted out. Where can I order new rails? I have been all over the net. I am also in the need for new bottom tracks for a Pacifica Model pool 24' wide. Also need a few new bottom posts the pieces that the bottom track slides into and the posts sit on. Where can I find them? 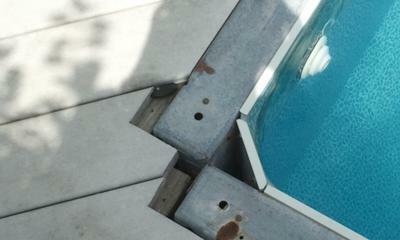 I am also looking to replace rusted out bottom rails for my 24' Pacifica 52' pool. where can I get them. I have a 24' round pool. I need to replace the top rails and caps. The only name I can find is in my paperwork and that is WIL-BAR INTERNATIONAL, INC. The existing rails on my pool are 49"-49.5" long, 6" wide, double lines on the inside and outside of each rail, and in the center slightly raised oval designs. The caps were plastic two piece. If you can help me located these parts I will be very grateful. Thanks! We moved into a house with an ovation above ground pool. Several of the top rail connectors have cracked/broken we are trying to find replacement parts. The pool is oval with dimensions 15(across)x30(long)x4(deep)x5.9(at the ends).